I’ve got a client who is busy. Like, crazy busy. When I challenged her to boost her daily dark leafy green intake, she was absolutely game – the only problem was figuring out how to fit them all into her insane schedule. It’s not too hard to get your greens on the go these days; practically every bodega in NYC carries kale chips. But if you’re buying all your greens at restaurants or in pre-packaged form, it’s easy to break the bank. And making leafy greens ahead of time is often a loosing battle – more often than not, you’ll end up with a soggy, wilty mess, especially if you’re so busy that you want to stretch a single recipe into multiple left-over meals. Enter, my Tough-Enough Kale Salad. Raw kale is one of the few dark leafy greens tough enough to last a day or two in the fridge, if you prepare it right. The trick is to pair it with items that won’t release a ton of moisture. I’ve added crunchy sweet peppers and dried cranberries to start, but if I wanted to make it more hardy, I might add shelled hemp seeds, nuts, or pan-fried tempeh. Especially if stored in an airtight container sans dressing, this salad will last a couple days in the fridge – perfect for taking to work for a power-packed lunch. 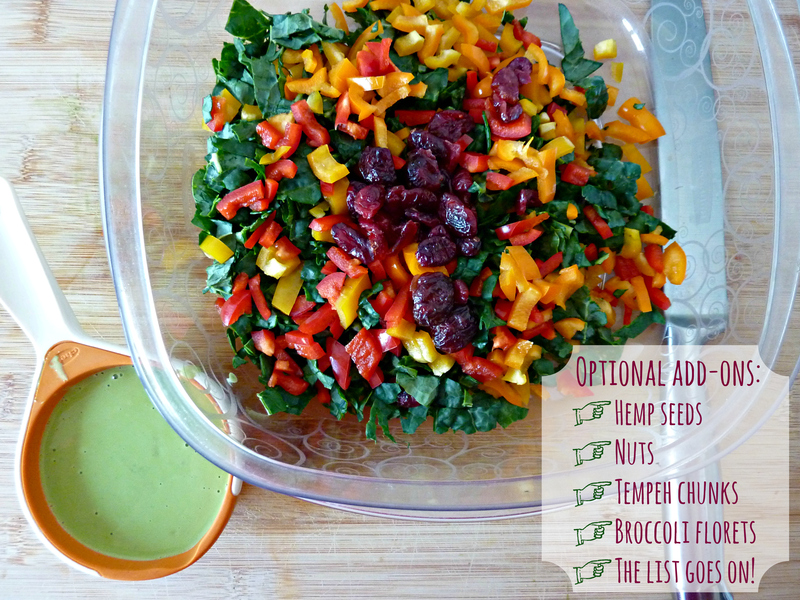 Anyone new to raw kale salads might be put off by the strong flavor or toughness of the leaves, so I recommend a few tricks to make it more palatable. First, I seek out Lacinato Kale (also known as Tuscan Kale) because this variety is slightly less bitter than curly leafed kale. 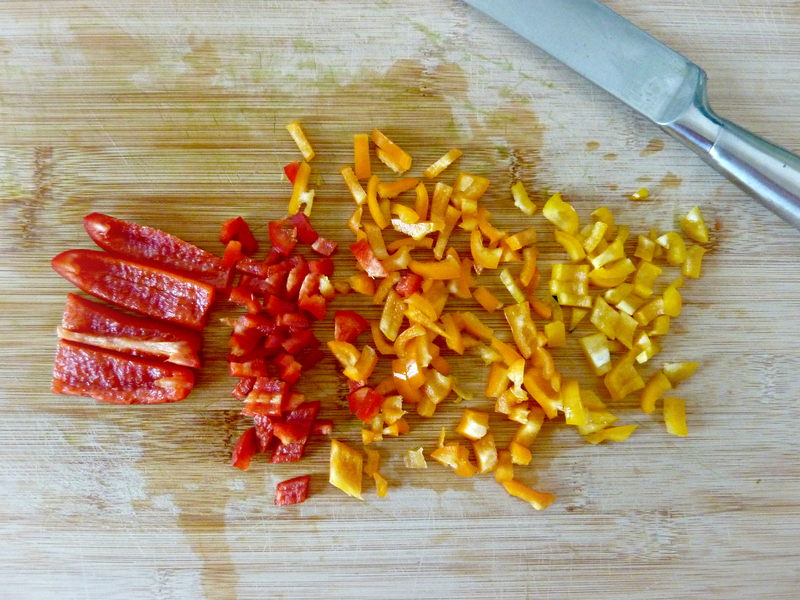 Its leaves are also smoother, which makes it less intimidating to clean and chop. Next, I cut out most of the hard, fibrous stems for a more consistent texture (see above left). Finally, I like to chop my raw kale very thoroughly when preparing a salad (curl those fingertips! ); not only do the smaller bites mitigate the toughness of the leaves, but I find they become more easily coated with delicious dressing – and I do not kid around when it comes to salad dressing. Speaking of salad dressing, my client isn’t ready to start making her own, and that’s just fine. The most important thing is that she gets the greens into the bod! 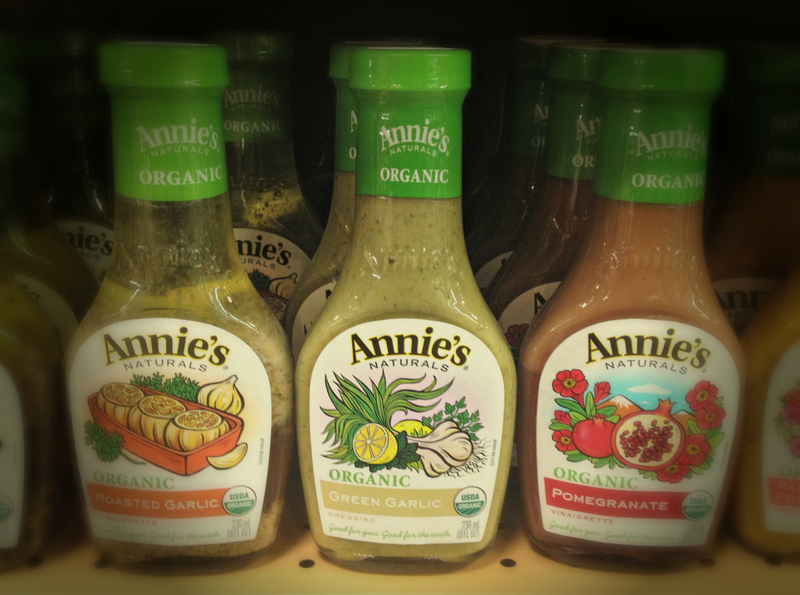 Annie’s Naturals makes some pretty decent products, and though I’m not a huge fan of using canola oil for salad dressings, I was inspired by this particular flavor and decided to try my own hand at a Green Garlic Dressing. 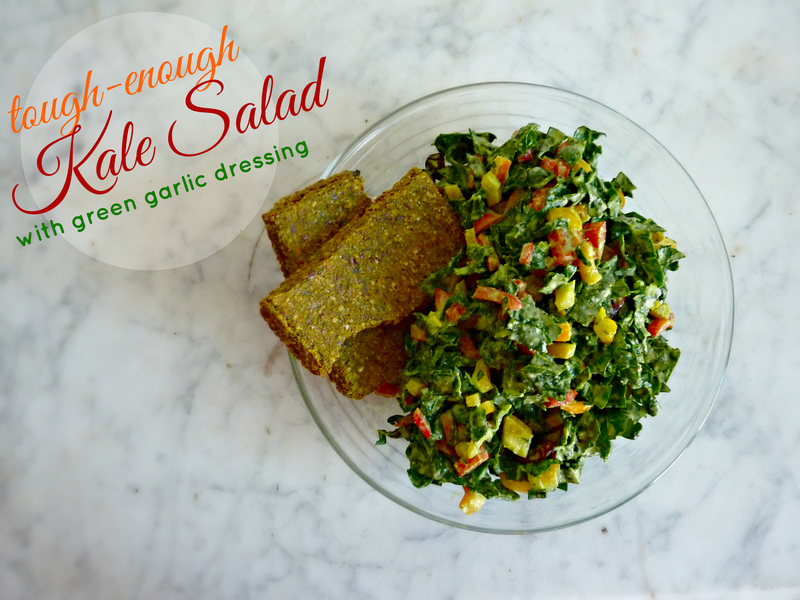 I may not have tried the original, but lemmie tell ya: this is my best salad dressing YET! Can’t get enough of it. Get creative, but keep it dry! Toss all the salad ingredients together. Makes 2 meal-sized salads. For the dressing, place all the ingredients in a high speed blender and whiz on high until fully incorporated and smooth. Makes about 2/3 c of salad dressing (good for at least 2 meal-sized salads).